Consume as a part of a healthy lifestyle and balanced diet. Cathedral City Towers are small sticks cut from our smooth & creamy mild lighter cheese providing your kids with 100% natural cheese, and calcium and protein for strong bones*. 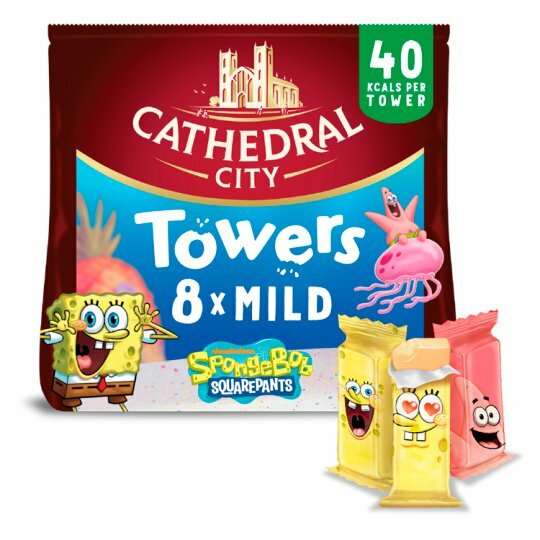 This delicious Cathedral City snack has only 40 calories** per Tower and is a perfect lunchbox filler or afternoon snack. * Calcium is needed for the maintenance of normal bones. Protein contributes to the maintenance of normal bones. Consume as a part of a healthy lifestyle and a balanced diet. Each tower packaged in a protective atmosphere. By Appointment to Her Majesty The Queen Suppliers of Fresh Milk and Dairy Products Dairy Crest Limited, Surrey.